Cut the pumpkin in little cubes and cook it in a large pot. Crush cooked pumpkin with a fork and add the preserved fruit, crushed Amaretti, chopped onion, nutmeg and the Parmigiano to the mixture. Stir everything together with a wooden spoon and ensure that the mixture is dry. With a pasta machine, roll out the pasta dough and cut the dough into rectangles, about 4cm x 8 cm. Put a teaspoonful of mixture on each piece of dough and fold the pasta over in the middle to enclose the filling. Press the edges together firmly. 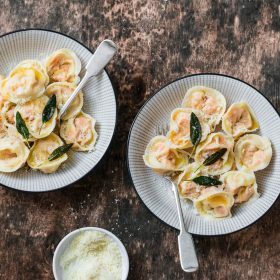 Cook the tortelli in plenty of salted water and serve with melted butter only. Place everything in your food processor, process until a ball is formed and the pasta is smooth and gleaming. Wrap in cling-wrap and allow to rest in the fridge for about 2 hours, preferably overnight.